Simple and low cost, ATHENA is a thermodynamic vacuum autoclave suitable for N type loads. GEA is a thermodynamic vacuum autoclave suitable for sterilisation of N type loads. All functions are microprocessor controlled. The autoclave can be connected to the mains water system through a water demineraliser (accessory available separately). 5 cycles for wrapped and unwrapped instruments. 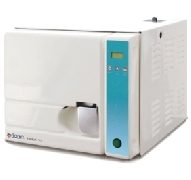 NEPTUNE PRINT is an autoclave with a vacuum pump suitable for the sterilisation of both S2 and N type loads. Easy to use thanks to the large graphic display and symbols. ZEUS 15 and ZEUS 23 are autoclaves with a double high vacuum pump, suitable for sterilisation of type B loads (fractionated vacuum), S2 loads and N loads. Comes with a built in printer. The vertical Autoclave LVA-D11 is a top loading sterilizer which provides safe, economic and effective sterilization of laboratory instruments. It is composed of stainless steel body with hand wheel type structure to quickly open the door. It is equipped with digital display to show working status and has touch key pad for the operations. Vertical autoclave has self inflating type seal, used to prevent liquid leakage. It can be used for sterilization of glass wares, biological materials, culture media etc. in hospitals, clinical laboratories, etc. Motor-operated door closure with triple-protection, guarantees better safety, greater ease of handling and automatic regulation of the door. Thermal printer built into the machine to allow complete recording of the sterilization cycle. Ensures the user greater cycle control and easy archiving. Multi-language graphic display easier for the operator to select the sterilization cycles, continuous control over the cycle phases and gives graphic indication of the errors committed by the operator. Stainless steel chamber made of a thick moulded one-piece stainless steel. High-efficiency low noise vacuum system. Large LCD display for BKM-Z18/24B. The LCD screen can display temperature, pressure, time, operating status, failure warning and other information. The system has various programs that include: packed items, unpacked items, custom program, rapid program, BD testing program, vacuum testing program, preheat program and drying program. Standard USB port for BKM-Z18/24B: user can store the sterilization data with USB disk. Optional mini printer can be attached to record the process of sterilization. - TYPE B LOAD: porous materials (textiles), hollow instruments type A (handpieces and turbines), thermoplastic and metal materials, both wrapped and unwrapped. - TYPE S2 LOAD: small porous loads (single textiles), hollow bodies type B, with big holes, thermoplastic and metal materials, both wrapped and unwrapped. - TYPE N LOAD: solid rubber and metal instruments without holes, unwrapped. Digital panel with water proof polycarbonate membrane board. Frequency from 45 kHz to 55 kHz, automatically controlled according to the load and to the working conditions. Fixed timer at 5 minutes. Very easy and quick. Suitable to clean small objects. Outside casing made of fireproof plastic, shockproof and corrosion resistant. Piezoelectric transducers fixed on truncated cones structures to increase their performance. Model BASIC: Timer from 0 to 30 min. 53 kHz Ultrasonic Cleaner which applies the latest overseas design technology, covers the features of Ultrasonic Cleaners with various frequencies. It is very effective on cleaning as well as mixing (dissolving, emulsification, adulteration), degassing, de-foaming, extraction and chemistry stimulation. With more powerful ultrasonic vibration amplitude, the 35kHz ultrasonic frequency is suitable for quick cleaning, easy operation, time display, is the best choice for general and practical applications. With more powerful ultrasonic vibration amplitude,the 35kHz ultrasonic frequency is suitable for quick cleaning, easy operation, time display, is the best choice for general and practical applications. Heating with temperature controller. Real-time displays of the set temperature and water temperature in the trough. Auto alarm and power-off upon boiling dry. Temperature Set Range: 20°C to 60°C.